This paper examines financial risk management from the regulatory perspective. It considers quantitative and qualitative aspects of risk management and how a regulator can view these. It considers such risk management problems as model errors and inadequate internal controls and how they may be dealt with from both the firm’s and regulator’s perspective. It discusses the interaction between capital, risk management and internal controls from a regulatory perspective. For good or for bad, the financial industry in Europe and most of the rest of the world is regulated by some official body or other. In some cases a firm (be it a bank, a securities house, CTA, investment bank or trading house) my be subject to many regulations and multiple regulatory oversight, does all this regulation actually do any good? Does it contribute to a safer and better world? Does it at least push firms into better operating practices, not only for the public at large but also for themselves? What I hope to be able to do in this paper is to give a small insight into how a regulator might view a firm, and in particular that firm’s risk management process, since the taking and managing of risk is at the very core of the business activity. Not least because for too long regulation has been seen by some as the enemy of common sense and I hope that the following paper may go some way to redress the balance. It should come as no surprise to anyone that regulators rank the firms they regulate and focus resources on those firms that do badly. SFA has a ranking scheme called “FIBSPAM”. It should also come as no surprise that the risk management grading within the score has a heavy weighting, and is partially graded by risk management specialists within SFA. Further it should come as no surprise that highly rated firms are treated differently from their less illustrious brethren in the form of a less intrusive visit cycle and the ease with which they gain capital concessions. If this does come as a surprise to you, I hope the following will help to explain why it should not. Firms with good risk management are deemed much less likely to fail or become a regulatory embarrassment. Risk management in this context is a complex and multi-dimensional process. There are many aspects of risk within a business enterprise, notwithstanding the better known ones of market risk, credit risk, operational risk, liquidity risk and fraud risk. Error or mishandling of any of these may lead to embarrassment in the press and therefore perhaps a reduction in business profile at the very least, or at the worst, to the failure of a firm through the breakdown of some vital internal control. Good risk management is therefore a form of foreseeing and limiting potential problems and in its very essence makes for sound business practice. It is only when good risk management breaks down and the problem becomes unmanageable that reliance on insurance in the form of equity (or subordinated loan) capital comes into play. Therefore capital by itself is not a substitute for adequate risk management; it acts as a back-stop or last ditch defence. Someone once said that trying to describe good risk management was like trying to describe a giraffe to someone who had never seen one. It is difficult to imagine what it looks like but you know it when you see it. In general, the inspections and checks that regulators carry out on regulated firms are not only to check statutory compliance with rules and regulations but also to investigate the adequacy of internal controls and therein the whole risk management process. It is certainly the case among more progressive regulators that indications that a firm is well controlled lead to less intrusive and less frequent investigation by the regulator and thus a lighter regulatory burden as partial reward for being a well risk-managed. The process of risk management can be viewed as two-stage. The first stage is about identifying risk within the business process and if possible quantifying its magnitude and sources. The second aspect is about setting limits and parameters into which the risk is constrained and controlled, in order to meet the goals of the business with a sensible and considered risk profile. So in order to be successful in risk management it is important not only to identify and measure but also to limit and control. In looking at a firm’s risk management a regulator will therefore view how a firm and its management use its internal controls in order to achieve these twin aspects of risk management. As with any control structure, it is expected there will be quality control mechanisms such as feedback loops and spot checks as a way of ensuring that the system is in fact functioning properly and allow the timely detection of errors. Some elements of risk management will be highly quantitative in the sense that the risk may be sensibly represented by numbers generated from quantitative methods such as probability or arbitrage pricing theory. In other aspects of risk management the risk may not lend itself easily to quantification (due to lack of data or complex parameterisation) but will require qualitative or comparative types of measurement and control. Thus some market risks with a wide availability of extensive data and a good deal of sophisticated analysis and option theory lends itself very readily to quantification of risk in numerical terms (however one does need to wary of placing too much faith in theory, especially as risk number are frequently quoted to an unfeasible large number of significant figures and without error estimates!) . But the quantification of operational risk per se is difficult, and indeed many aspects of these types of risk have more to do with interaction of humans and the dependence on or criticality of certain key roles or individuals within an organisation. However, just because a risk cannot be readily expressed as a number does not mean that it does not exist nor that it cannot be managed. Indeed many of the solutions in operational risk areas involve a system of dual control, or alternatively some process of review and a negative feedback loop, so that a lack of adequate review will in fact automatically trigger an event that has to be acted upon. One of the hardest elements to quantify within an organisation is the effect of political struggles or a person’s career aspirations within that organisation which may lead to an individual’s actions, which are not within the best interests of a successful firm wide risk management framework. These types of risk must be taken into account in looking at the risk management of a firm. We focus for a moment on market risk as one of the more complete areas of the risk management framework; that is from the point of view of both qualitative and quantitative standards and techniques. The basic risk management necessity here is to identify the sources of market risk that a firm is prone to, and analyse how that risk profile may evolve over time in terms of profit and loss variations, such that the possible and potential profit and loss variations are within the framework of the organisation’s aspirations in terms of risk and return and overall financial stability and longevity. The cornerstone of this market risk management operation is clearly the data. This means data not only in the form of position information, i.e. accurately describing the type of obligation or contract or risk entered into both from the long side and the short side, but also information for the mark to market process: for example FX or equity spot prices, yield curves and interest rate volatility curves. The whole risk management process will therefore hinge on the quality and adequacy of the data that is fed into the quantitative aspects of the market risk management process. Clearly, things can go very wrong here if not all the information is captured or if the information which is fed into the system comes from a dubious source; for example, from the front office area with the perspective of a trader wishing to manipulate positions for his own ends, or from a market which has very little price transparency and perhaps is illiquid in some sense. It is therefore important within market risk management as far as possible to ensure, even at the first level, that the information that is feeding into the risk management system is both as complete and accurate as possible and that some effort is made to quantify any errors. In any real world situation there will be uncertainty, and this needs to be quantified if possible and monitored on an ongoing basis. The importance of this process cannot be over-estimated, and indeed it is dangerous to underestimate the thoroughness and accuracy with which market parameters need to be determined and verified by a firm for a successful risk management process. Indeed a comparatively large amount of conflict between firms and their regulators stem from the mark to market process and also from the representations of risk within the risk management framework. It is not uncommon in areas where firms deal in products that are difficult to mark to market due to complexity or illiquidity to rely upon the “in house” expert, who is generally the trader and who naturally has a vested interest in the P&L (particularly the P rather than the L!). In most organisations the P&L is a major direct factor in determining the overall compensation of the trader or risk taker. His involvement therefore in the determination of the P&L has to be strictly controlled and monitored, as history has demonstrated to us many times. There is an overwhelming temptation to make things look better than someone who is more independent might assess them to be. The risk to the firm is not only that of being duped into paying more than is fair but also that the firm’s risk capital base is over estimated and it believes it has more capital buffer than it really has, possibly even falling below the minimum capital requirements of its regulators. Clearly this has ramifications for systemic risk. Similarly, in the area of new products, the development of new risk types (for example: external barrier option or credit derivatives) puts an onus on the existing risk management system to keep an adequate book and adequately represent its risks within a current framework. This can lead to situations where deals are booked outside the main system and become what are known as “NIS” or Not In System trades. These are a particular area of concern to regulators, as generally speaking they do not have the same level of control and oversight that other more traditional areas of the business would have. From a regulatory point of view and indeed from a good business point of view it is therefore necessary to control the way that new products and new risks are brought into the firm. Indeed the control or degree of discretion that self-interested individuals have in the profits should be managed sensibly and reviewed by people who can be more objective. Once the information is in the system we of course need to be sure that the system performs its task according to its design. The testing and implementation of a system is thus an important part of establishing a good risk management framework, as is the security of the source code in the existing system and further releases of that system. The systems themselves will have undergone extensive testing, not only from a functionality viewpoint but also from the viewpoint of verification of the task or processing that they perform. Most of these systems operate on a database with an algorithm/model that performs some sort of processing to generate risk management numbers. The resulting number is frequently stored back in the database. Thus the ability to sort information from the database and to aggregate that information so as to give a complete breakdown of the risk subject to different queries is an essential feature of the risk management system. Item 1 Detailed rules create an unsatisfactory capital regime. That is to say complex line-by-line rules are a very easy way of creating opportunities for people to take risk without putting up capital against that risk. The most effective way is to have a principal of capital against risk rather than a line-by-line complex rule. Item 2 Capital is not a substitute for effective risk management. This is because if one does not measure and control risk it is possible to lose any amount of capital excess and drive the firm into jeopardy. Capital is back-stop insurance to the risk management process. Item 3 Financial institutions are responsible for their own health. It is not the regulator's responsibility to prevent individual firms from going bankrupt. The regulator's responsibility is to the non-professional investors and to the health of the financial system as a whole rather than to individual regulated organisations. Firms are in the business to take risk for reward and as a consequence of taking that risk may go bankrupt and more importantly should be allowed to. As Dr Alan Greenspan, Chairman of the Federal Reserve Board once said “the optimal number of bank failures is not zero”. Item 4 Level playing fields are an unnecessary impediment to effective supervision. The Basle and then the CAD paper were created in order to standardise and create the possibility of a level playing field between financial institutions in Europe. But the actual supervision of a particular entity is not predicated on, nor is it necessary for effective supervision, for it to have exactly the same standing with regard to risk capital as its competitors. It is therefore not necessary for a supervisor as a matter of priority to ensure a level playing field. However, generally speaking the legislation provides for a level playing field, and as part of the supervisory activity it is administered in a way that a level playing field is created as far as is prudent. 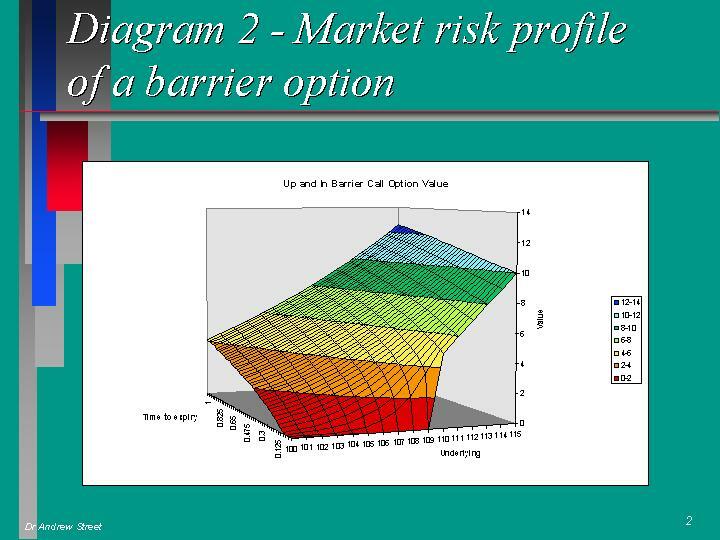 barrier options of the type called “up and out” call options. It is possible to obtain a very large change in value that occurs rapidly over a very small movement in the underlying market. A risk management system looking at the situation purely from a sensitivity analysis (i.e. the Greeks delta, gamma etc.) approach would completely fail to miss the potential pitfall if the market moves a few points away from the current spot levels. Therefore it would be vital with this type of risk to do scenario analysis (portfolio revaluation over a range of underlying movements) in order to establish the potential loss for a range of market movements away from the current spot levels. In just the same way as risk management cannot not be performed from the P&L (since it is retrospective and like trying to drive a car forward whilst looking in the rear view mirror), path dependent risk is best considered by doing scenarios rather than static risk measures. We have considered market risk as a particular case for risk management. As I have previously mentioned other risks include counterparty risk, operational risk, legal risk, “reputational risk”, liquidity risk, fraud risk, funding risk and many other forms of risk. SFA’s prime concern with risk in general within regulated firms is the protection of investors and the prevention of systemic meltdown. Practically speaking this means making sure that adequate risk management across all risks exists within a firm as a form of accident prevention and that maintenance of capital as a form of insurance in the case of a particular crisis is enforced. Focusing once again on market risk, we can define it as the quantification of the change in value of assets and liabilities as markets move. In the risk management process we need to value assets and liabilities. This is usually achieved via the mark to market. In marking to market there needs to be adjustment not only for the bid/offer (bid/ask) spread but also for the liquidity (market size / quote) in that particular market at that particular time. Liquidity can be considered as the market size (notional) that a transaction may be undertaken in, at the particular prices that the bid and offer are quoted at that time. Thus liquidity is dynamic and is a function of market volatility such that in liquid markets in normal times comparatively large transactions may be undertaken at the bid or offer price with relatively little market impact. In times of market uncertainty, however, such as after a crash or during economic turmoil (such as in SE Asia in late 1997), it may be impossible to deal in anything like normal market size at the indicated price. The models that are used to create the standardised risk profile of the derivatives contracts are, as stated before, only an approximation to reality and frequently contain assumptions that may not always hold. A key assumption that is frequently made concerns the ability to construct a replicating portfolio and the costs involved in rebalancing such a portfolio - clearly illiquid markets severely test such assumptions and call into question any valuations derived in this manner. The risk management system, as well as containing a database and processing engine, will invariably contain some kind of financial model. This model could be, for example, an option model, discounted cash flow model or a convertible bond model. In the case of a swap the model is used to process the particular form of contract (schedule of cash flows) into a present value (PV) and to examine the sensitivity (DV01) of the present values to changes in market parameters such as the 1y or 5y interest rate. Most models are of course based on simplifying assumptions. For example, many option models are based on arbitrage pricing theory, which in a Black-Scholes type approach assumes that underlying market prices are pure geometric random walk processes with zero bid/offer spread and infinite liquidity. These simplifying assumptions allow the construction of a replicating portfolio, which by arbitrage arguments has a total replication cost equal to the value of the option or derivatives contracts to be valued. If any of the assumptions are in practice seriously challenged, then the valuation that these models give can be very far from the actual replication or hedging costs that would be incurred in attempting to risk-manage the particular product or risk profile given by the model. Sensible valuation may only be possible by realistic hedge simulations using Monte-Carlo methods for example. One needs to consider the adequacy of the particular modelling approach not only with regard to the particular type of risk (e.g. put option) but also for which underlying market that risk profile is actually to be underwritten. It is perfectly reasonable, for example, for a model to be used for a liquid short dated FX (foreign exchange) option, say, Garman-Kolhagen which would give results for valuation and sensitivity for risk management purposes that were perfectly acceptable; whereas the same model perhaps applied to a long-dated option on individual illiquid equity (say in Korea for example) may in fact seriously and erroneously ascribe a value to the risk which is perhaps much lower than a more considered and prudent approach. Thus a good risk management framework will give serious consideration to the applicability of particular modelling approaches to types of risk, and will restrict models on the basis of the type of risk to be modelled. In order to model other risks it may be necessary to employ a different modelling technique, or to use an existing model but to make an estimate of the possible error in valuation and sensitivities that may be obtained using that particular model. Techniques such as Monte Carlo simulation can be used in order to assess this 'model error'. It needs to be stressed that model error is not an error in the algorithm, or the implementation of the particular algorithm, but is the error of the particular modelling approach in relation to the real world situation that is being assessed. It is not unusual that models used within organisations actually contain conflicting assumptions on underlying processes. An example of this would be the use of the Black type model for the evaluation of bond options (where prices are random walks) and the Black model for the evaluation of swaptions (or swap options) (where a random walk of the underlying yield is taken as the stochastic process). In both cases log normality of returns is assumed and it is impossible to have a lognormal price return whilst simultaneously having a lognormal yield return, given the relationship between price and yield of a discount bond. This in itself does not necessarily represent a breakdown in the risk management framework, but it must be borne in mind that the localisation of risk management may not optimise the risk management of the entire firm. Localised risk management on a desk-by-desk basis may mean that arbitrage may be possible between the different kinds of products (but essentially the same risks) within the same organisation, which is clearly not a particularly satisfactory situation from a risk management perspective. Models generally require calibration to market. In the case of complex yield curve models (for example Heath-Jarrow-Morton), where information on term structure and its volatility are vital inputs derived from a large amount of caps/floors, IRGs, swaps and swaptions prices this process can be very time consuming and can lead to ambiguity. There may be insufficient information to choose between two calibrations that achieve equal ability to reproduce market prices. In the area of complex interest rate products it is not unknown for two counterparts to trade a product and both book a mark to market profit on the transaction, not only when different models are used, but in some cases with the same model but with a different calibration. Once acceptable and applicable models have been chosen, developed and tested within the risk management framework, the processing of the contractual risk (as evidenced by the contract and deal confirmation) into valuations and sensitivity to input market parameters can be used to generate risk reports. These risk reports may take the form of aggregate point Greek sensitivities to risk. Delta, gamma, rho and vega and so on are workable symbols. Or it may entail an analysis of the change in the portfolio's value over a range of scenario moves in the underlying price, or volatility, or some other parameter of market risk. Generally speaking the term structure risk could also be considered by bucketing or compartmentalising the portfolio into smaller portfolios, perhaps based on principal component analysis of yield curve moves, grouped by aggregate exposure to some particular point in time. For example, three months to six months, one year to two year time buckets. These reports form the basis of understanding the risk profile of the book. As such, they are vital in the communication of the current level of risk on the portfolio and as a tool for planning risk exposure for the future and controlling current risk exposure by the comparison of risk against risk limits. Risk limits are a dynamic quantity in the sense that they indicate from management to trading desk the magnitude of particular risks that are desired at any point in time. It is not unreasonable to expect that during times of expected market turbulence that management may in fact decide to reduce risk limits in order to minimise the impact of any large move upon the firm’s portfolios. Generally speaking a firm-wide risk management committee or ALCO (Asset/Liability Committee) will be responsible for varying risk limits based on information and expectations of market conditions in the near future. They may also vary limits based on the results of trading over a period of time in which P&L’s versus Risk have been higher or lower than expected. The ALCO is therefore responsible for reviewing the performance of portfolios against their risk limits and in setting and varying those risk limits, in accordance with the desires of the firm’s risk and return profile. It is therefore the ALCO that sets the risk return policy of the firm rather than the individual trader down on the desk. This is consistent with the firm's most senior management being directly responsible for setting the risk appetite of the organisation and controlling that risk appetite according to the required level of volatility in P&L. This method of analysis of control also has the potential benefit of detecting problem areas early, and in the setting of risk capital and trader remuneration according to the risk-adjusted return on the capital assets. The ALCO is, of course, entirely reliant on the quality of the information and analysis with which it is fed. It is therefore vital that an independent group (independent of the risk taking process) exists which is responsible for ensuring that the processing of the information that goes to the ALCO is as complete and accurate as possible and is independent of those people that the ALCO seeks to manage, i.e. the traders. It is therefore vital that the ALCO can trust the information it receives and can expect that that information has been thoroughly vetted and checked by the independent risk management group. It is also likely that the independent risk management group will have the authority of the ALCO to control the risk within ALCO’s framework. On detection of limit violations it should have authority to reduce the risk to within those levels set by the asset liability committee without further reference to anyone else. After having restored the limit excess it would, of course, look for explanations of the reasons for that violation. It is possible that the trading group may apply to the ALCO for an extension on an ad hoc basis, which after due consideration may or may not be granted. In addition to the quantitative risk management that the risk management system kicks out to the ALCO, the ALCO itself will require other forms of information that relate to qualitative market conditions and also to the development and progress of new products or new systems within the organisation. This is so that the ALCO is aware of how the changing risk profile of the firm fits in with the current market environment, and how any expected changes may be anticipated and planned for in good time. Given the very important task that the ALCO performs, it is clearly essential that it is composed of experienced senior individuals (with junior front-line individuals used during the discussion process to inform on the points necessary to understand the risks). Typically the ALCO will consist of a representative from the independent risk management group, the trading group, the product control group, the treasury/funding group and the credit group within the organisation, along with at least two members of the board responsible for the firm. It is also vital that minutes are kept and that decisions are documented so that there can be no uncertainty in the future about the required course of action required and mandated by the asset liability committee. The committee also needs to consider whether there are risks that are being run within the organisation which are not covered by a limit and which are not considered directly by the current risk management framework. The independent risk management group must continually look for and research other areas of risk that are inadequately captured within the existing risk management framework. How might a regulator view the ALCO’s potency within the firm? The regulator looks for an understanding of the trading mandate and an understanding of risk within all levels of the firm. This should not only be at the front desk level but through the middle office into the operations area and also upward through trading management and ultimately to the organisation's senior management (the ALCO). One of the clear indications of this need to communicate is the existence of unambiguous written guidance and policy with regard to each individual’s role and responsibility within the structure. Other co-factors are the security of the systems and data and the overall approach to information technology within the organisation. Clearly risk management information and ALCO decisions are only useful if they are communicated accurately and distributed punctually to the appropriate people within the organisation. The independent risk management group, whose role has been described in relation to the ALCO, also needs to carry out additional tasks such as price testing. This means the verification of mark to market values and also the continued validation of risk modelling. This has the twin aspects of ensuring that positions are realistically valued and that the risk measurement system is able to practically explain (attribute) P&L movement over time to the identified risk factors. The risk limits that the ALCO sets need to be of a type appropriate to that particular business line. It is not inconceivable that limit types may be different from one business to another within the same organisation. As an example, we may consider an asset swap type operation where cheap bonds (high yield) are bought and set up (hedged) against interest rate swaps to create LIBOR plus assets. This type of business would not be constrained by pure parallel or rotational shifts of the yield curve, since the majority of the risk is actually imbedded in the credit spread (yield differential) between the interest rate swap and the bond rates. The risk limits that the ALCO set need to constrain the trading operation in terms of the risk reward ratio that is actually desired by the firm. Therefore it should be impossible under the limit structure for the firm's existence to be jeopardised by a conceivable event (such as has occurred in the past), unless of course this is desired and mandated by the shareholders. For some organisations it may be acceptable for the firm (say a small trading partnership where all the partners are active traders) actually to go bankrupt in, for example, a 1987 crash scenario. However, this particular magnitude of risk appetite must be one that is clearly understood by the firm and taken consciously, rather than something that happens by accident. Any firm that operates at this limit will of course be subject to very close scrutiny by the regulator and possibly higher capital charges, since it is operated in a way where there is a probability of default much greater than the average. profiles of the book based on a scenario analysis under which historical events are used as bench markets for the changes in value of the portfolio. Stress tests are designed to determine events, which may or may not have occurred in the past that is pathological to the particular portfolio in question. Stress test are therefore portfolio dependent. VAR or value at risk type numbers are generated using historical data to establish the particular magnitude of the likely maximum loss at some confidence interval. The common VAR approaches may be one of covariance, Monte Carlo simulation or historical revaluation. The traditional technique with regard to derivatives portfolio is to use the point Greek sensitivities with respect to market movements. These sensitivities quantify the rate of change of value of the portfolio with respect to changes in the underlying price, interest rate volatilities etc. All of these measures naturally give rise to limits which can be set by the ALCO in order to constrain the business to the desired risk return profile in the various dimensions of market risk in which the firm wishes to active. The use of scenario analysis is to search for particular sets of circumstances which lead to extreme P&L behaviour within the existing portfolio. The scenarios which are created are therefore synthetic rather than real market moves from history. The process of searching for the most pathological set of circumstances is useful for looking towards possible future events or circumstances that could lead to that particular scenario occurring. The effect of scenario analysis is to focus the mind on the possible results of future events in terms of P&L impact. Risks in markets change rapidly, not only from the point of view of the shape of the portfolios but also the market itself. For this reason real time monitoring, if possible, is extremely beneficial from the point of view of managing risk and ensuring that the risk stays within limits. Regulators will generally look for daily risk reports as an absolute minimum standard. The overall value at risk (VaR) number provides an indication of the general level of risk within the organisation on a big picture basis. Generally speaking as a risk management tool in isolation it has serious flaws. These flaws stem from the necessary approximations (in terms of the stability of covariance matrices, or that future events resemble history) that have to be made in estimating the VAR. VAR in itself is then potentially a useful tool for high-level observation of risks and returns, monitoring capital allocation, and also the overall regulatory capital requirement, but it is dangerous to use in isolation without the consideration of stress tests, scenarios and Greek sensitivities. This is because VAR is the aggregate and probable, whereas the P&L occurring under a stress test are in some sense an idea of the maximum possible downside rather than a probability weighted and correlated downside. Regulators will also be looking to see how the firm’s policy handles losses, from the point of view of stop loss practice and the cutting of positions. They will also be interested in how it handles the problem of liquidity or funding against illiquid positions. This is because it is often difficult to see from balance sheet figures that illiquid positions exist. For example an illiquid bond position hedged with futures can suffer an adverse movements in futures prices, this can lead to margin calls which can not be met from existing banking lines, and the illiquid asset cannot be realised due to its lack of marketability. Liquidity adjustments are the changes in evaluation of the market value of positions due to their abnormally large or abnormally small size. Let us take for example a bond position that exists in twice the normal market size of £10M on the bid on £10M on the offer. Then the mark to market price would need to be adjusted to reflect the market impact of doing two market size trades, back-to-back, in order to flatten the position. This liquidity adjustment in this particular case may take the form of using half the bid/offer spread below the bid price in order to establish the liquidation value. Other estimates could be used based on market information e.g. monitoring price movements (volatility) as a function of market transaction size. The purpose of this liquidity adjustment is to establish the effect of illiquidity within the portfolio. As an extreme example we could imagine a portfolio of Gilts (UK Government Bonds) which had a value of, let us say, £100M, compared with a portfolio of long-dated illiquid derivative positions, options perhaps on single emerging market stocks. This could also be valued at $100M (not allowing for liquidity). Clearly, in the event that the firm needed to liquidate positions to fund, shall we say, a margin call on one of its other books, then the Gilt portfolio is much more likely to be sold quickly for a price close to its balance sheet mark to market value. It would be highly unlikely that the illiquid positions in derivatives would be realised at anything like the same speed, or indeed at a price that was anything remotely connected to its mark to market valuation. This liquidity adjustment is therefore vital if the figures within a firm's balance sheet, P&L and risk management reports are going to be comparable on a like-for-like basis and one is therefore sensibly able to look at the asset/liability mix of the firm. Within the organisation evidence of consideration of model risk and inadequately captured (or poor) information can be demonstrated and the problem mitigated through the use of both provisions and reserves. These provisions provide for unexpected or unanticipated costs in the future associated with managing the risk which are not currently priced in to the current risk management framework. For example, it is possible to take into account some of the model risk by using a provision. It might also be appropriate that P&L’s or expected P&L’s on long-dated positions may actually be taken as provisions to be released over the life of the instrument or indeed at the end of the life of the instrument when the total hedging costs are known with certainty. Such an approach would avoid the classic symptom of long-dated products accruing immediate day one P&L which is used to pay bonuses in the very early days of the risk management process prior to the realisation of the actual cost of running the risk position to maturity. This lack of foresight by some firms has lead to difficulties in the past. So-called star traders have accrued large profits and large bonuses in the early life of the book only to disappear to another organisation and do the same, leaving a risk management problem in the later period of the life of the product which in essence all but consumes (in some cases more than consumes) the total P&L booked upfront. Let us consider other internal control issues that regulators inspect within firms. Indications of good risk management within a firm are clear levels of authority, for example, escalation events which trigger progressive involvement of a more senior individual along the chain of command based on the magnitude of, for example, a P&L move or risk changes. A powerful indication of strong internal controls is also a sign-off at each level of authority based on the individual assuming and taking responsibility for any change in risk profile up to his particular authorised limits. The new product procedure in which new products or risk types are introduced into the firm is an important area from a risk management / internal control perspective. This is because new products frequently have unusual risk profiles and may be of a form which cannot be readily booked or controlled within the existing risk management framework of the firm. Any well risk-managed firm will therefore have extensive new product procedures, which will identify what is a new product or new type of risk. They will also have appropriate techniques (e.g. review, sanity checks) of sign-off at each level and in each department within the organisation to ensure that these products can be handled safely. If they cannot be handled safely within the existing framework then they are handled in a way, which minimises their risk to the firm in terms of their total amount of volume or total number of transactions. This could be particularly true where they need to be handled outside the main system, for example on spreadsheets, where a limit on the number of not-in-system (NIS) or spreadsheet trades is actually imposed upon the organisation by the risk controllers. If these products become more popular, the spreadsheet type procedures may be transferred into the main risk management system with the appropriate modelling, thereby freeing capacity for other new products to be handled in an NIS fashion. This tends to be a natural migration for new products which become mainstream. The role and involvement of internal audit within a firm is of great interest to regulators. The reason for this is simple. The regulators realise that even the smallest firm is a relatively complex animal which cannot be completely understood from relatively infrequent visits nor remote monitoring by regulatory reporting. Thus the internal audit function has the opportunity to review and monitor the activities of a firm on an ongoing basis in a way which is much more intimate than any regulator could hope to achieve. It is the strength of the internal audit group along with the comprehensive nature of their review that forms a major comfort for any regulator. The acid test however is the action of the management of the firm in respect of recommendations made by the internal audit group in their report. It is pointless for the internal audit to raise concerns or highlight weaknesses within the organisation if their recommendations are ignored or their implementation is delayed over a long period of time. The staff experience within internal audit is also a factor from a regulator's perspective. Other risk management factors that regulators take into account include the experience and competence of dealing, middle office, operation and management staff. This includes their number and experience and also their ability to work together and to understand the framework within which they are asked to co-operate. This naturally leads to an assessment of the maturity of the whole system in terms of the elimination of teething problems and resolution of areas of uncertainty within the risk framework, coupled with the day to day handling of the workload and any problems. From a regulatory standpoint the expectation would be that management would continuously review and monitor the risk management process using techniques of feedback loops (for example, deliberately inserting off-market prices or dummy deals and seeing if they are spotted) and critical analysis of what is and is not working. It might be appropriate to insert test conditions within the framework on an anonymous or confidential basis to assess the ability of the system to detect and correct errors. It therefore necessitates the critical analysis by management of what is working and what is not and remedial action based on the measurement of that process. In summary, the risk management process requires continuous review and detective action by management in order to ensure a robust and workable framework and any sensible regulator will expect to see management doing exactly that. When looking at a firm from a regulatory standpoint and examining its risk management capability, it is important to consider the size and complexity of the organisation. Large financial trading entities will typically have traders located overseas who book positions to a parent entity (for example, the London base parent organisation), global books so that positions are managed on a world-wide basis with the risk management being passed around the world from time zone to time zone, but actually legally remaining on the books of the London entity. They will frequently have complex derivatives, perhaps even ones that depend on multiple assets; maybe combinations of FX, equity indices and interest rates. They will typically have many portfolios for trading in many different types of asset class (FX, equity, interest rates, commodities, credit etc.) not only cash trading but also in derivatives. They will typically trade twenty-four hours per day in all products (although out of hours volume are generally very low, e.g. FTSE in Asian time). As a consequence of their global nature they will frequently have long reporting and communication lines and almost certainly there will be considerable office politics involved in the way the firm is managed and run. The political aspects cannot be underestimated since it is possible that good risk management practices can actually be undermined by the political desires or aspirations of individuals within the framework. From a risk management perspective something, which is possibly good for the firm, may in fact be bad for an individual or for a part of a business group, and of course this creates a political problem. Large firms frequently have multiple systems that have been developed over time or inherited from firms that have been merged to form the large entity. These multiple systems bring with them their own problems from the point of view of compatibility and the lack of “seamlessness” with which they communicate with each other; it is not unusual for systems to operate in such a manner that a large amount of reconciliation between systems and manual rekeying of data is required so that the risk management process can operate at all. Small firms, having a limited number of personnel, can be relatively simple to understand but may suffer from the problem of staff having too many responsibilities, possibly conflicting. Generally speaking small firms have small budgets for information technology, and this may mean that the systems are underdeveloped or simplified, or are in fact custom systems which have not been enhanced for the current business situation. Small firms tend to be specialists in one area, and so this means that it can be easier to understand the business flows and the interactions with the clients and markets. Generally speaking they are also in one place and this makes communication and inspection easier from the regulator's point of view. They have the added advantage that the senior individuals within the firm are probably involved in the front line of the business. This involvement of senior people at business level can give small firms an advantage over a large firm, but can pose the problem of objectivity or segregation of duties. Small firm may be more vulnerable from a capital point of view since they are likely to be less diversified and run on smaller capital excesses, close senior management involvement at front office level can thus be even more important. How then does a regulator approach the problem of examining a firm's risk management practices? This is a difficult task, but not completely impossible. An examination will generally involve not only a practical investigation of systems, personnel and reports, but also following the flow of risk information through the organisation and assessing integrity and understanding in different areas such as middle office, back-office, risk group and management. One of the techniques is to ask the same or similar questions in each area of the firm on the same issues and compare the answers given at each level. This allows some indication of the consistency and understanding of the risk management approach across the organisation, particularly on adequacy of risk management training and internal communication. Another technique to use is to ask for information on the spur of the moment, without notice and without waiting for that information to be prepared especially. This gives some indication of the availability, timeliness and completeness of the information available within the firm. This will give no indication of the accuracy but it will give an indication of how promptly information is available to staff, especially when compare with their stated work practices. Another important factor to examine is whether the risk parameters used in the risk management process actually explain the profit and loss profile achieved over time. Thus movements in the risk factors such as market level or interest rate when multiplied by the portfolio risk sensitivity parameters such as Delta, Gamma and Vega should actually match up with the achieved profit and loss from revaluation; if they its does not there should be a suitable explanation as to how the unexplained profit and loss arises, for example from commission trades, intra-day trading or unquantified risk factors. This area is generally known as actual versus forecast P&L, and the cleaning of actual P&L to take into account non-market risk P&L such as commissions or funding is called P&L cleaning. Clean P&Ls should in fact be well explained by the risk parameters used in the risk management process. If the level of explanation is below 90%, for example, then it could be concluded that there are significant risks that are not being properly measured or controlled within the risk management framework, and new risk factors may need to be introduced. Another technique that regulators can use in their practical investigation into the risk management practice of firms is to attend risk meetings. Regular risk meetings can be an indication of a positive and collective (team) approach to risk management within the firm. In these meetings it is important to assess how risk is discussed and to what extent each individual within the group meeting has access to and understanding of the same level of risk detail. Are the meetings democratic, are sensible decisions taken and are they followed up? Other investigations include discovering whether all the risk positions on the firm's books are actually captured within the risk management system. Frequently there will be trades outside of the main system (not-in-system trades) that are commonly handled in a spreadsheet environment. It is important to assess that these NIS trades do not pose a serious threat to the risk management integrity of the firm due to potentially a lower standard of measurement and analysis than might ordinarily be applied within the normal risk management framework. This is particularly true with regard to the modelling of risk and the estimation of model error. Equally the quality and conservative nature of the input parameters and the determination of market values may suffer. The internal audit department plays a vital part in the risk management process. This group potentially has the opportunity to examine and review the risk management process over a long period of time with a far greater degree of depth than any regulator could hope to achieve. From a regulatory standpoint therefore it is important to assess how the internal audit group are viewed internally. The firm's attitude towards its internal audit may well determine its preparedness to act upon recommendations made by that group. Thus internal audit reports and their recommendations, and more importantly the response of management to those recommendations, can be a strong indicator of the preparedness of the firm to adapt and change its risk management practices in response to positive criticism internally. When traders are physically located offshore, or they institute trades on behalf of a regulated entity in another country, it is important for the regulator to understand and to some extent verify the controls which are imposed upon them by the management of the firm to which positions are booked. Generally it is considered more difficult to monitor and control activities far away from the parent organisation, especially when the trading occurs overnight. Given the responsibility management has to the financial integrity of its firm, it must show clear control of its overseas traders, even when their are no staff physically present in the parent entity to which risk is being booked. The control of risk-taking by individuals located away from the parent company is an important factor in the overall risk management of a firm. This is particularly true when the traders are active at times when London or home-based management is asleep. It is therefore vital that suitable controls are in place to limit the amount of unauthorised or extreme risk assumed by traders located offshore. So in any practical investigation of risk management within a firm it is important for the regulators to understand the nature of any offshore trading and the mechanisms in place to limit that trading to the desired risk return appetite of the management. It is also important that these people located offshore are aware of the possible restrictions placed on their activities by the requirements of their parent: not only from their business management point of view but potentially from a regulatory perspective as well. This may well cover conduct of business as well as capital adequacy. Further techniques that a regulator may employ to assess risk management include the investigation of the same issue in different areas of the organisation. An example is asking the question where the greatest risk lies to the trader, the middle office, the independent valuation people, trading management and senior management. In comparing and contrasting these answers it is possible to build up a picture of potential risk management weaknesses. The firm's attitude towards financial provisions and reserves (and who decides them) can also be indicative of the sophistication of the risk management process. It is also indicative of who controls and has authority over the risk management process, since the providing of provisions in general reduces the profitable P&L impact of trading and therefore tends to dilute the perceived returns generated by the trading operation. Within many organisations traders are kings and therefore any individual who is able to provision against their profits is in a position of power within the risk management framework. An independent risk management group who has this capability is clearly more than just a puppet. The ability of the risk management group to provision traders' profits and indeed to recommend or implement changes in risk profile is one of the distinctive hallmarks of a truly independent and potentially effective risk management group. Details of their actions in the past in this respect are powerful supporting evidence of their potency. Any regulatory review of risk management within firms is going to take a great deal of time in the area of mark to market. As mentioned previously the mark to market is the cornerstone of the risk management of the firm and any error in this area can lead to serious errors throughout the whole system. The firm’s approach and attitude towards mark to market and the seniority of individuals involved in making mark to market assessments is a strong indication of the robustness of the risk management framework. Generally the regulator will look for VaR (Value at Risk) type analysis, scenario analysis and stress tests of a market event type in order to ascertain whether the firm has a sufficient variety of techniques and methodologies to assess risk. The regulator will invariably be looking for limits on all types of risk activity which designate the maximum size of a particular exposure in a risk factor. They will be looking for concrete evidence that these limits are taken seriously and acted upon, that these limits are set in a way that the risk appetite of the firm is adequately described, and that the limits themselves interact with the trading size of the firm. For example, limits that are many times the current market risk positions or even many times the largest risk that has ever been taken in that risk parameter may be viewed as completely unconstraining from a risk management point of view, and possibly indicate a weak attitude to the setting of limits and perhaps avoidance of the issue by management. In these circumstances this is not really a limit but merely the idea of risk always being within the limit, sensible or not. The regulator would expect these limits to be tested in the normal activities of the firm and the demonstration of risk being managed and constrained within limits be obvious to the observer. The regulator's investigation into the risk management of a firm will invariably be based largely on questions and the analysis of answers and documentary evidence received. These questions seek to indicate and verify the understanding and attitude towards the risk management process. It would not be unusual, for example, to ask the senior executive officer for his views on where the weaknesses lie in the existing risk management framework of his firm. The answer that there are no weaknesses would clearly be met with a certain degree of surprise. Since, generally speaking, any framework or system will contain elements which are slightly less robust than others. In general, it would be expected that policy would be to improve these areas over time. In talking to an equity derivatives trader it would not be unreasonable to ask a question along the lines of what would be his maximum loss under a 1987 equity market crash scenario. He may be able to answer very readily due to the use of scenario analysis but one needs to probe further in terms of whether his answer includes the probable changes in volatility, or indeed the underlying hedge illiquidity that would probably follow such a market event. 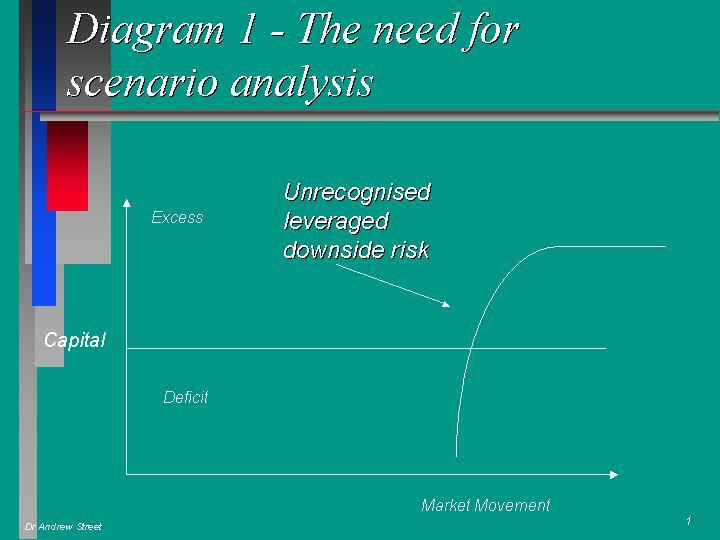 Consideration of these factors makes clearer the possible magnitude of loss under such a scenario that may not be included in a simple model of a market move, but more importantly demonstrate the extent that the trader has thought about the limitations in such scenario analysis. In talking to an independent risk manager one may ask questions, for example, about bid/offer spreads on illiquid positions. This poses a particularly difficult problem since a mark to market is necessary in order to feed the risk management and P&L systems. For truly illiquid products it is of course impossible to obtain a market valuation. Therefore other techniques must be used to bound (in the mathematical sense), in a conservative manner, the possible values of this risk. For example, this could be achieved using the technique of limiting the value of an American option to intrinsic value or exercise value. Needless to say, the regulator is looking for a proactive and conservative approach to the problem of valuation and would view a general lack of understanding of the problem in this area as potentially very serious. The person involved in verifying market prices may well be asked how they verify long-term volatility or correlation in relatively illiquid markets like long dated equity derivatives. For example, in pricing long dated call options on an equity underlying, quantod (i.e. currency protected) into another currency, it is necessary to establish the forward price of the underlying asset, its volatility, the FX volatility and correlation between the asset and the FX rate. All of these factors are very difficult to obtain from the market and indeed there is a further problem over which time horizon to chose for their measurement. This task is hard enough for the trader and so when someone other than the trader is checking the prices it is all too easy for that person to rely on the trader's market value. This has clear implications for a breakdown in the risk management framework whereby the trader may in fact deliberately input optimistic prices for his or her positions. This appears to happen all to frequently. A further question to ask the SEO is to ask him to quantify the loss that would occur if, for example, a repeat of the 1994 bond market crash occurred. More interesting would be to follow up with the question as to whether this size of loss was within the trading mandate or risk appetite of this firm. He may well regard this event as unlikely, but it is a possibility. Therefore the firm needs to be comfortable that the size of loss that this possibility entails, no matter how improbable it is, is in fact within the realms of possible outcomes that the firm has deemed acceptable. It is also a useful approach to ask a trader what he would do if he was asked to quote a price on something he had not traded before although which was similar to some of the type of products already on his book. This to probe the tricky area of what constitutes a new product or a new risk, and seeks to examines how closely a trader's product mandate has in fact been defined. It also attempts to examine his or her preparedness to trade a new type of risk or product without that risk or product first being examined by the new product process and approved by all areas of the firm including operations, compliance and management. The regulator's overall view therefore is that good risk management is good business and more importantly it should work rather than be a sop for the regulators. To remain effective, any risk management system on a large scale needs continuous review and challenge to stay current. It is the firm and not the regulator that has to drive this process, since it is impossible for any regulator to have the detailed, continuous knowledge of its operation that the firm itself must have to operate. Risk management involves the entire organisation and there is no element that is not included within its framework. In examining risk management within the firm the regulator needs to test and challenge the effectiveness of internal controls and understanding, not through detailed rules but through practical demonstrations of acceptable and workable minimum standards within the firm, appropriate to that particular operation. The firms that demonstrate good, proactive and dynamic risk management should be encouraged and rewarded by the regulator in terms of a less onerous regulatory burden, both through fewer visits and lower regulatory capital charge. Lower risk capital charges are therefore a reward to be won and not a right to be demanded. Indeed a poor performance in a voluntary risk management review may result in higher rather than lower charges for the complacent and poorly managed firm. In this brief paper I have outlined some of the qualitative criteria upon which a statutory financial regulator may review risk management practices within regulated firms. It has outlined some of the possible areas of focus and the some of the perspectives that a regulator may place upon certain aspects of financial risk management. It has also discussed some of the techniques and methodologies of review. I have considered how risk management needs to be viewed in terms of the particular firm and risk being considered since it is must be viewed situation specific. It strongly argues in favour of “risk not rules” and encourages a framework where firms are encouraged organically (not taught or lead) to better risk management practices through regulatory incentives such as less intrusive regulation and lower regulatory capital charges. It strongly argues that good risk management is good business and both regulator and regulated have a strong mutual interest in continually striving to achieve it. The Securities & Futures Authority is the regulatory body responsible for the regulation of securities trading firms in the UK. It regulates approximately 1400 firms. The SFA and the Bank of England Banking Supervision Division collectively regulate all wholesale investment business in the UK. Regulation in the UK is undergoing a substantial change in 1997/1998 such that nine regulatory bodies, including the two mentioned above are to be merged into one super regulator called the Financial Services Authority. Provisions are taken against unknown risks, reserves are for known risks whose outcome or cost is uncertain, e.g. a reserve may be taken for model error whereas a provision may be taken for general uncertainty.